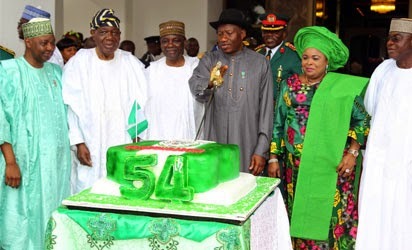 President Goodluck Jonathan (3rdR) and wife Patience cut the anniversary cake, flanked by (from L) Vice President Namadi Sambo, former Interim President Ernest Shonekan, former Head of State General Yakubu Gowon and Senate President David Mark as they celebrate Nigeria’s 54th independence anniversary in Abuja on October 1, 2014. Abuja— President Goodluck Jonathan, yesterday, on the occasion of the country’s 54th independence anniversary gave his administration a passmark for delivering on most indicators of good governance. In a nationwide broadcast to mark the anniversary, President Jonathan also called on members of the Boko Haram sect to lay down their arms and embrace peace, saying anybody who has genuine grievances would be heard. He said the country will ensure the safety of every Nigerian, adding that the country’s armed forces need support to fight the terrorists. But the President’s award of a pass mark to his administration came on a day the Mo Ibrahim Foundation released the 2014 Ibrahim Index of African Governance, IIAG, which ranked Nigeria 37th out of 52 in the overall governance scale, rating the nation 45.8 per cent lower than the African average (51.5 per cent). The country scored lower than the regional average for West Africa which stands at 52.2 per cent and ranked 12th out of 15 in the region. According to the President, his administration is committed to making Nigeria safe for all Nigerians, irrespective of their places of birth, religion and political persuasions. “To all those waging war against our country, I ask that you lay down your arms and embrace peace. To those who have genuine grievances, I affirm that Nigeria will listen to you, if you bring your grievances to the table of dialogue,” he said. While noting that his administration has made remarkable progress in bequeathing a better Nigeria to generations yet unborn, the President regretted that the accomplishments do not call for celebration yet because “Nigeria is still in a sober moment. “In my address to the nation last year, I did emphasize that we were in a sober moment in our country. We are still in that mood in spite of the many accomplishments of our administration. “Our sombreness has to do with the crises of nationhood occasioned by the activities of terrorist elements who have done the unimaginable to challenge our unity as a people,” the President said. He assured Nigerians that the terrorists waging war on the country would fail as they do not mean well for anyone. He said their deliberate attack on the weakest and most vulnerable in society underscores their depraved minds. Speaking on the 2014 National Conference whose recommendations have been submitted to the government, President Jonathan promised that the recommendations of the conference would be implemented. While admitting that the nation’s 54 year-journey had not been easy, he said the Nigerian spirit and the unflagging resilience of Nigerian peoples have seen the nation through. “We will continue to march forward to greater heights,” he promised. The President pointed out some of his achievements but promised that these would be built upon in the interest of the nation. On the forthcoming 2015 general elections, President Jonathan enjoined the political class not to use the contest for positions to destroy the polity. “The contest for the leadership of our country must yield good governance, and not ungovernable spaces. The love of country should rank higher than our individual ambitions. “We must remain committed to a united and indivisible Nigeria within democratic parameters. The protection of individual rights, liberty, equality before the law, freedom of thought, and a progressive pursuit of a sound economy must be our goal. “As we look forward to another year in our national life, I am more than confident that our tomorrow will be better than our yesterday and today. Nigeria has got the human and material resources to excel and we shall lead the way in that journey to our manifest destiny. “Fellow countrymen, brothers and sisters, in all our plans, and in all our words and our actions, we must stand together in love and unity, as one people under God” he said. President Goodluck Jonathan later led former Heads of State, the leadership of the National Assembly, the judiciary and other top government officials to celebrate the nation’s 54th independence anniversary at an event which was held at the forecourt of the Presidential Villa, Abuja, which featured the Presidential Change of Guards and colours Parade. The parade was performed by men of the 177 Battalion, Presidential Guards Brigade, Keffi in Nasarawa. Other features of the colourful event included inspection of new guard/quarter guard, silent drill, posting of sentries/colour patrol and echelon reporting of parade, among others. Others were foot and arms drill, rhythmic and calculated steps and checking of weapons to ensure they were clean and that rounds of arms were not left in them. At the end of the parade, Jonathan signed the independence anniversary register and released pigeons to signify peace. He was accompanied by the President of the Senate, Sen. David Mark; Service Chiefs; the Acting Inspector-General of Police, Suleiman Abba, and other dignitaries. Among other dignitaries at the event were former Head of State, General Yakubu Gowon (rtd), and former Head of the defunct Interim National Government, Chief Ernest Shonekan; former Vice President Alex Ekwueme; Deputy Speaker of the House of Representatives, Mr Emeka Ihedioha, and former Chief of General Staff, Lt. Gen. Oladipo Diya (rt). Speaking on Nigeria’s independence, General Gowon said that the country will overcome its challenges and remain indivisible beyond 2015. “I believe in Nigeria. I love Nigeria, and we all must work for Nigeria; that is everybody, including the government and the opposition, in order to make Nigeria great. That is my wish,” he said. President of the Senate, Senator David Mark expressed optimism that the future was bright for the country, adding that Nigeria would come out of its current challenges stronger and more united.